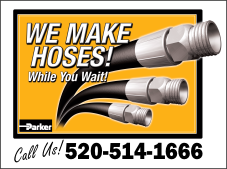 American Hose & Rubber Co.
About American Hose & Rubber Co.
American Hose & Rubber Company has been providing a wide range of industrial and hydraulic hoses, along with fittings, to businesses in the Southern Arizona and New Mexico regions since 1999. Ensuring our customers receive the quality service and products they deserve is the cornerstone of our business philosophy. Active ownership by the company’s founders brings 100 years of combined experience in the industry into the shop every day. While we have an incredible variety of ready-made products, we are able to create industrial and hydraulic hose assemblies on a walk-in basis at our fabrication shop. We also have field service capabilities for those special jobs that require multiple assemblies to be created at the job site, as well as the capability to support customers with hoses and fittings that have in-place crimping equipment. Our customers can be assured that the products supplied by American Hose & Rubber are manufactured by companies who are well respected throughout the industry for their quality. We look forward to serving your needs.